The Nissan Qashqai boasts many improvements centred around design, quality and technology. The Qashqai shines with Nissan Intelligent Mobility, continuing Nissan's ongoing journey towards "zero emissions and zero fatalities". The Nissan Qashqai is Europe's best-selling urban crossover and it is now available in South Africa sporting premium enhancements perfect for the urban lifestyle. Nissan has designed a new crossover with new levels of luxury inspired by the needs of the customer. A major part of the "premium enhancements" focuses on Nissan Intelligent Mobility technology (NIM). It is at the core of every vehicle and is setting new standards in the crossover segment. The Patrol and X-Trail have considerable NIM features and the Qashqai is following suite. Intelligent Blind Spot Warning: Alerts the driver of a vehicle in the adjacent lane during lane changes. It also offers Traffic Sign Recognition. Intelligent Emergency Braking: This helps avoid collisions by detecting the distance of the preceding vehicle and activating the brakes, if necessary. It is also being upgraded with Pedestrian Recognition. 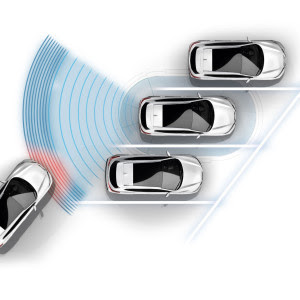 Intelligent Forward Collision Warning: Sensors analyse the relative velocity of the preceding vehicle as well as the vehicle in front of the preceding one. If the system detects potential risks, it alerts the driver to slow down with visual and audible alerts and will also tighten the seat belt. Around View Monitor: Provides you with a 360-degree view of your surroundings using five cameras positioned around the vehicle. Intelligent Cross Traffic Alert: When backing out of a parking space, this feature can reduce the risk of low-speed impacts and warn the driver of vehicles that are approaching behind the Qashqai. Moving Object Detection: The system analyses video signals in an image-processing unit from the cameras attached to the front, rear and both side-view mirrors of the vehicle. It is then able to detect certain moving objects around the vehicle in real time. The stylish interior upgrades are more sophisticated and driver-orientated. The Qashqai exhibits a sporty multi-function D-shaped steering wheel – which has a horizontal base to make entering and exiting the Qashqai easier. The steering wheel is finished with satin-chrome inserts. It features four-way controllers on the steering, offering the driver less "eyes off the road" time. The cabin features an improved layout, higher-quality materials and advanced technology. The interior door handles and air vents are finished with higher quality material and new stitching is added to the centre console armrest. The top range Tekna+ grade shines with new seats trimmed in high-quality nappa leather and 3D-quilting along the centre panels. The Qashqai's cabin uses improved absorption materials and increased rear glass thickness to reduce cabin noise from the road, engine and wind. One-touch power window switches allow all windows to be opened and closed remotely via the key fob. The front seats feature tapered shoulders which offer additional support and improve visibility for rear passengers. The Nissan Connect touch-screen satellite navigation unit has a smart new user interface. The roof antenna is now in the shape of a shark fin for improved reception. Inspired by customers' requests Nissan has adapted their sound system. Customers who enjoy blazing through the city to the sound of electrifying music are accommodated with an optional Bose seven-speaker premium sound system with tweeters, woofers and a digital amplifier. The Qashqai's integrated microphone has also been moved to the overhead lamp unit to improve performance. The Qashqai is not only luxurious but also practical with its 430-litre boot which increases to 680 litres when the 60:40 split rear seats are folded flat. The stylish interior design extends to the Qashqai's exterior with the completely revised front end featuring the latest "Nissan V-motion" grille. The "boomerang" Daytime Running Light signature has been revamped with nine LEDs. The adaptive front lighting improves night-time safety. The taillight motif extends across the whole light and includes contemporary 3D lens effect to enhance the signature shape. The Qashqai sports new impressive 17” and 19” alloy wheels, all aerodynamically optimised to reduce drag and maximise efficiency. 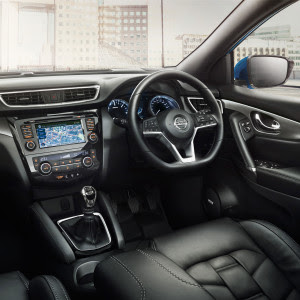 Nissan has taken customer feedback and improved the Qashqai's ride, handling and steering resulting in a comfortable ride with calmer body motion. The dampers have been retuned, the anti-roll bar stiffness has been increased to maintain handling performance. To make the ride more enjoyable and calm the NIM Active Ride Control System reduces body motion while going over large bumps. 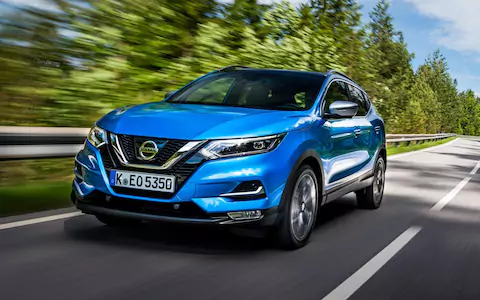 With the striking new design and advanced technology, the Nissan Qashqai is perfect for zooming through the city but also great as a family vehicle. Nissan has designed a dynamic vehicle that is sophisticated and stylish yet still practical and remains economical.